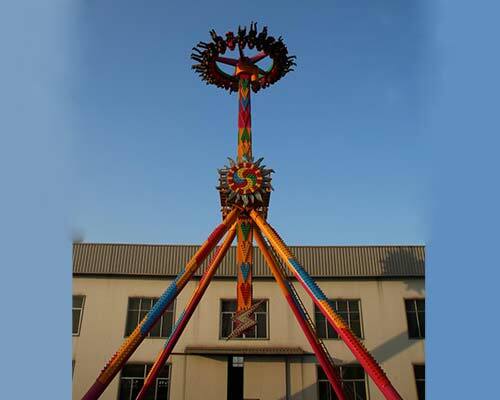 Pendulum ride is a large-scale amusement equipment, which belongs to the thrilling ride. 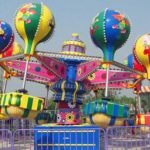 It is very common in the major amusement park and theme park. 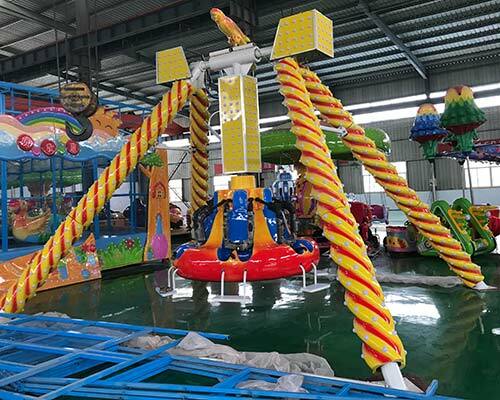 The pendulum swing ride is mainly composed of four supporting columns, one swing arm and round cabin, driving system and control system. Passengers sit separately in the round cockpit and face outward. 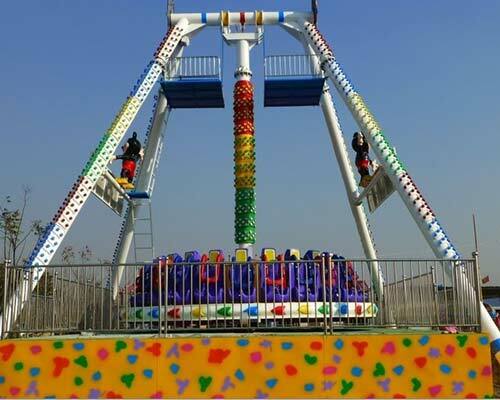 Generally, the pendulum ride has double safety insurances with the pressure bar and safety belt. When the round cockpit rotates, the main shaft which hanging the round cockpit will do the simple pendulum motion under driving of the motor. 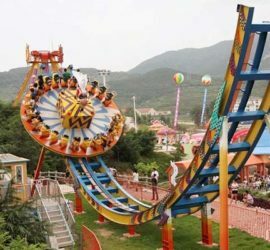 Passengers sit on the ride and enjoy the happy and thrilling atmosphere, which also brings much attractions to the park. 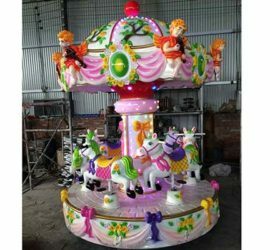 There are many different types of the pendulum amusement rides, and generally they can be classified as giant frisbee ride, mini pendulum ride and pendulum ride 360. These types can be distinguished from the size, seating capacity and rotating degree. A. The motor is equipped on the top of the facility, and equipment gets power from the top part. B. Amplitude of swing is larger. It can reach a wide angle of 100 degree at each side. C. More stable on running. 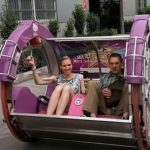 Because it gets power from the top part, it will be more stable on running, and passengers can have a better experience when riding. D. Price will be higher. As there are differences on the structure and working principle, the cost will be higher for top drive type. A. The motor and transmission system is under the equipment, and power is released from the lower part. B. The equipment swing through friction with the tires, which is similar to the starting way of the pirate ship. C. The swing range is about 60 degree at one side. D. High safety factor. 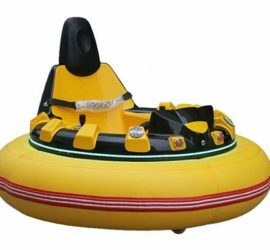 This type ride has a high safety factor, and good braking capacity. 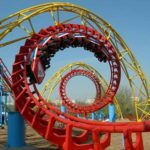 It fits for people who do not like so much thrilling and horrible ride activity. 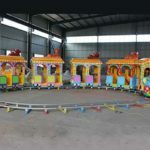 Both types rides have their special features and advantages, you can choose according to your real demand and preference. 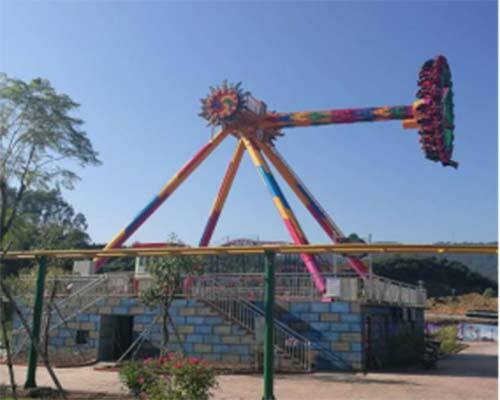 Mini pendulum ride is one of the most popular amusement rides among kids. It has novel style and beautiful appearance, and it can swing smoothly back and forth. 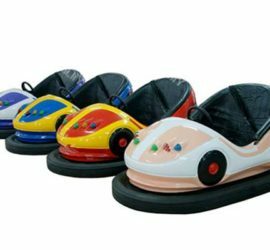 Normally, there are 6 seats of the mini frisbee ride, and the seats are arranged in the circle. The round cockpit is made of high quality FRP material with bright painting outside. On each seat, there is the pressure bar, safety belt and the foot plate, which can make passengers sit comfortably on the seat and feel safe. 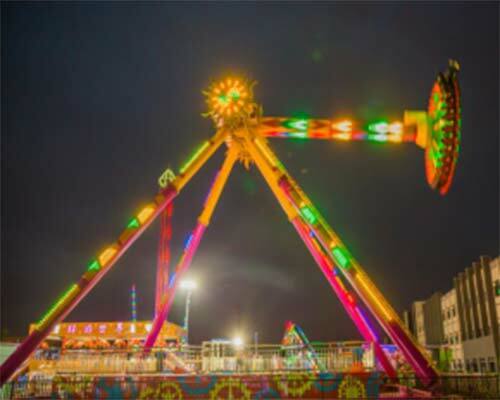 On the surface of each supporting column and supporting arm, there will be decorated with the FRP material tube, on which there are many colorful lights. 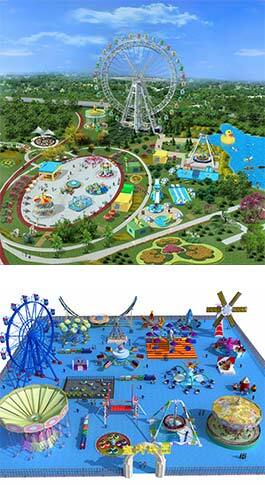 It will make the mini frisbee ride look more gorgeous and attractive. 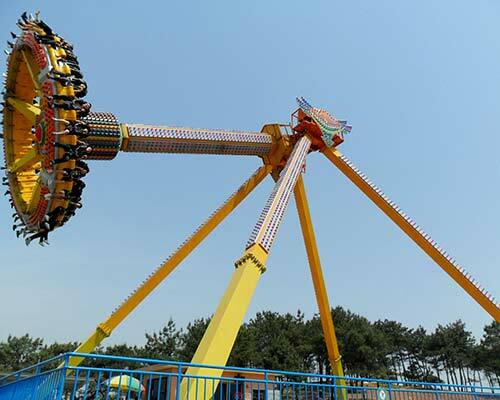 Pendulum ride 360 is a special and very thrilling large amusement equipment. It can rotate with 360 degree, and make you totally upside and down. 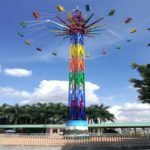 If you are the brave and want to try something new, the 360 swing ride will be your best choice, and leave you unforgettable experience. When the equipment starts operating, the round cockpit rotates in 360 degree by itself, and the big arm supporting the cockpit will rotate vertically in 360 degree too. Passengers sitting in the seats can have strong feeling of fear or excitement, and they will cheer and shout loudly. 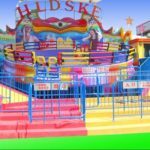 Giant frisbee ride can be found commonly in the amusement parks, theme parks or fairgrounds. 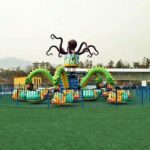 It has seating capacity of 16 seats, 24 seats and 30 seats, and can attract many people to play on. 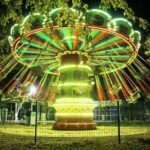 For the rotating range, the big pendulum can reach up to 45 degree to 90 degree at one side, so you can experience both left side swinging and right side swinging. 1. 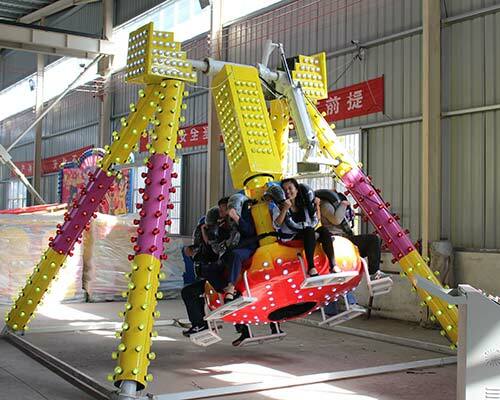 The pendulum swing ride is equipped with multi-functional electrical control cabinet and other auxiliary appliances, which can ensure the start-up and safe operation of the equipment. 2. The control cabinet is used to control circuit of the driving device, bell button and so on. It is very simple and safe to use. 3. On the whole equipment, it will be equipped with luxury lighting, which makes it more grand and beautiful. Especially in the night time, you can see it running at first sight in a far distance when the lights shinning. 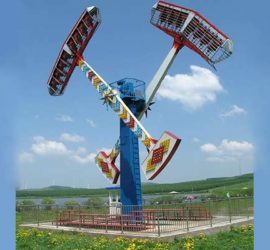 The rotating pendulum is a large rotating amusement equipment. 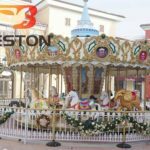 It consists of the main supporting columns, hanging device, pendulum, and electrical system. The main body of the pendulum adopts a truss structure, and outer shell of the big pendulum is made of fiberglass reinforced plastic (also called FRP) material. 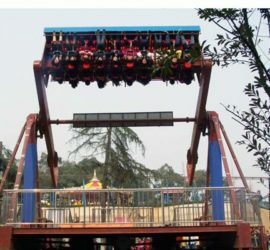 The spinning pendulum ride is equipped with seats and safety pressure bars, which help to ensure the safety of passengers. 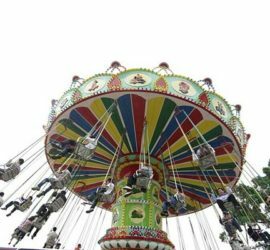 The movement principle of pendulum ride originates from the real pendulum, and its moving orbit is also similar to the real pendulum. Under the big supporting arm, there is a round disc. When the big arm swings like the pendulum, the disc below the big arm is doing the turnaround movement, and it can rotate in 360 degree. 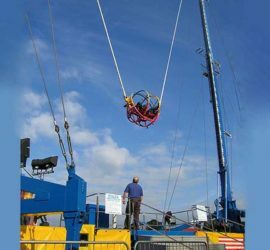 During equipment operating, passengers sitting on the ride can have the strong feeling of centrifugal sensation and weightlessness, which just feel like they are in the space. 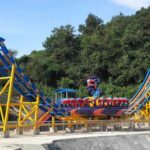 As the pendulum ride is large equipment and thrilling ride, when riding, there are some safety matters need your attention. 1. During equipment operation, please do not stretch your hands, arms, feet and other parts of your body randomly. 2. Do not untie the seat belt or pressure bar. 3. Please follow instruction of the working staff, and line up in order. 4. Please take off your watches, phones, decorations, and other items in your pocket, and put them in a safe place. In order not to hurt yourself when you enjoy the happiness.